Yoga is the most effective way to normalize blood circulation by reducing stress.High blood pressure is a serious problem.Bad habits of unhealthy food,gas,insomnia and consumption of extra salt this disease is created.Hyper blood pressure that is hypertension damages many parts of the body like mind,eye,heart,kidney and body's arteries.If there is a problem of high blood pressure then you are more likely to have heart attack,vein cracking and kidney failure.The patient of high blood pressure should do yoga regularly. Regular practicing yoga stabilizes blood circulation and eliminate many other health problems. Shava asana - For this pose first of all lie down on the back after lying leave all limbs and muscles loose.There should not be any clash in your body.Now close your eyes after this slowly slowly take a deep breath and leave.Spread your arms slightly apart from the body on both sides and leave them loose. As much as you keep the body loose,the sooner you will get the benefit. Make this asana twice for 10-10 minutes a day. Shitali asana - High blood pressure is also controlled by making this asana. It keeps the mind calm and helps in keeping anger in control.To do this pranayam first sit in the condition of sukhasan after this put both of your hands on the knees in the knowledge posture. Keep your eyes closed by keeping your mind and mind calm.Make both sides of the tongue like the modes of the upper side and the round tube and then take the breath away from your mouth.Now try to stop as long as you can stop breathing and breathe out with the nostrils of the nose. Do this action at least 10 times. Setu bandhasana - This asana is useful for reducing hypertension and works to improve blood circulation.First lie down on the flat surface.After this drag your legs on the hip.Now keep a little difference between the legs and hold the ankles with your hands. 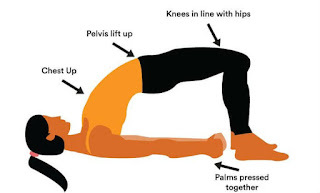 Please note, your feet should be parallel to each other.Now try to rise towards the roof with your back,hip and thighs.Lift the waist more and more and keep the head and shoulders on the floor.After reaching the final position keep the speed of breathing normal and stop for some time.Now come back bring your back on the ground, then the waist Bring the waist in the upper part and finally to the ground. Important - Take an Expert Advice before start any asana.